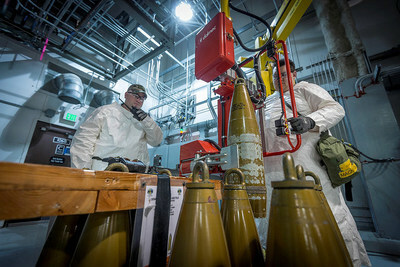 RESTON, Va., Feb. 5, 2019 /PRNewswire/ -- The Bechtel-led team at the Pueblo Chemical Agent-Destruction Pilot Plant, or PCAPP, is marking a significant milestone: safely eliminating 100,000 munitions from the chemical weapons stockpile located at the U.S. Army Pueblo Chemical Depot in Colorado. The destruction of these weapons – all containing mustard agent – is a requirement of the Chemical Weapons Convention, an international arms control treaty signed by more than 190 nations. "This milestone is a key step forward in achieving our mission here at PCAPP," said Bechtel Project Manager Bret Griebenow. "It is significant, and shows the operational ability of the plant, and our team, to safely and effectively destroy the remaining weapons." "As we conclude our pilot testing and move to obtain our final operating permit, we are excited to see increased and consistent productivity, reliability, and sustainability of our processes and procedures," said PEO ACWA Site Project Manager Greg Mohrman. "Achieving this milestone is a time to pause and document our successes, while continuing to focus on the safe destruction of the remaining stockpile." A first-of-a-kind robotic process is used at PCAPP to neutralize weapons by removing the explosive components from each projectile. The robotics then remotely access the weapon's interior and drain the liquid agent. The agent is chemically neutralized using hot water followed by the addition of a caustic solution so the chemical process can't be reversed. The resulting wastewater is transferred to the biotreatment stage, which consists of large tanks containing microbes that digest and further break down the solution into brine. The brine salt is separated and disposed at a permitted facility, and the water recycled back into the plant. The metal munition bodies are heated to 1,000 degrees Fahrenheit for 15 minutes and later shipped off site to be recycled.